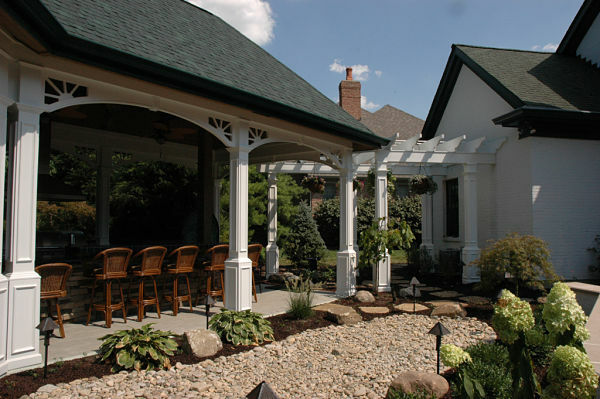 A veranda addition was designed as an outdoor haven for year-round entertaining. This project was recognized by the National Association of the Remodeling Industry (NARI) and received a “Contractor of the Year” award for Regional Exterior Specialty. The owners of this stately home in Mason, Ohio enjoy entertaining family, friends and business associates. Their goal was to build an outdoor living area that would accommodate a large crowd for dining, relaxing and enjoying conversation. The homeowners own a design firm and worked directly with us to plan the project. A sheltered addition that would blend with the architecture of the existing home and landscape. 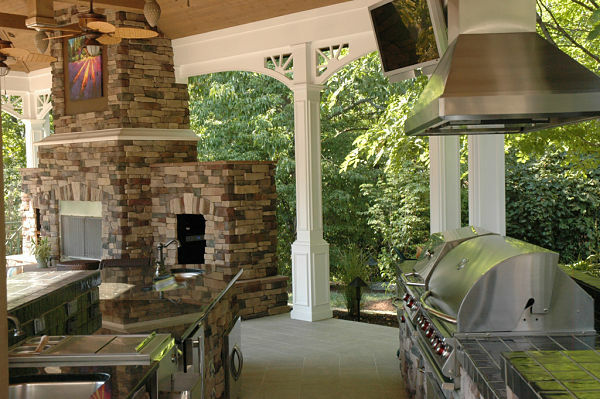 A functional, modern outdoor kitchen set up for preparing and warming meals on-site. An outdoor living space that could be used not only during summer months but also throughout the year. Décor that reflected the eclectic design tastes of the homeowners with rustic, transitional, Victorian and tropical elements. 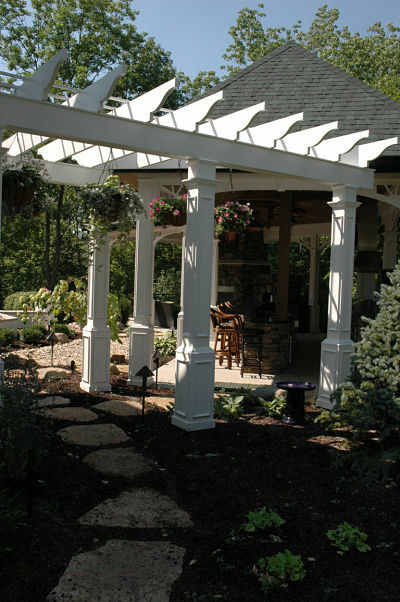 Creating a design for the addition to complement the architecture of the home. Since the home is large, the addition would need to conform to scale. Fitting the addition into the mature, established landscape and preserving the existing terrain. The lush gardens and tall trees were important to the homeowners and needed to be considered in the design and construction plans. Building within the guidelines stipulated by a homeowners association. The covenant prohibited stand-alone outdoor structures and the plan would require approval. Incorporating the homeowners’ decor preferences into a well-conceived aesthetic plan. The homeowners had a vision for the addition and their design ideas needed to be addressed in the plans. 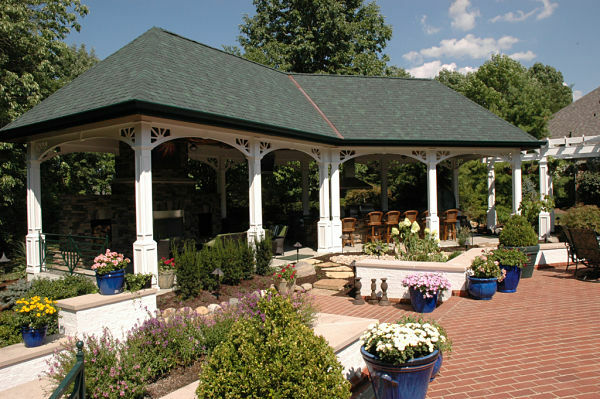 A 750-square-foot veranda addition with a 12-foot vaulted ceiling and 10-foot columns was designed to meet the homeowners’ objectives. Roof tiles were matched to the existing home. 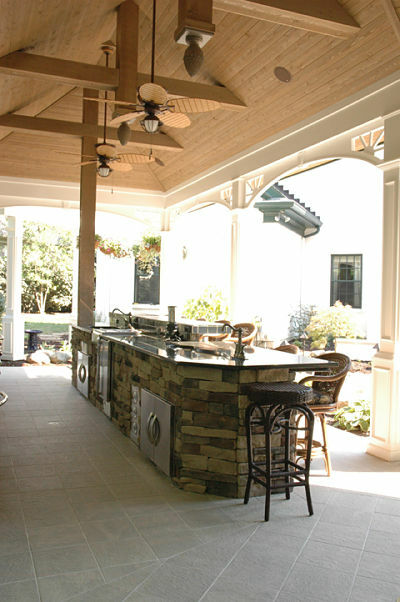 An outdoor kitchen was designed for the structure. Appliances included two stainless steel grills, a massive exhaust hood, a warming drawer, a cooler and icemaker. A “Mystic sink” from Elkay and Moen “Vistage” faucets were added for function and style. 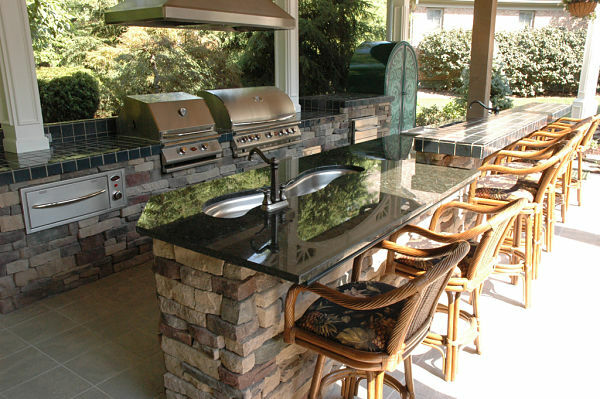 A large tiered culture stone bar with counter heights of 36 and 42 inches would provide an area for food prep with a second sink and comfortable seating for six. The upper level counter is from Oceanside Glass Tile “OE Casa California-Tahoe” and is a non-iridescent glass. The lower countertop is granite. The backsplash tile is also Casa California’s ”Tahoe” design. 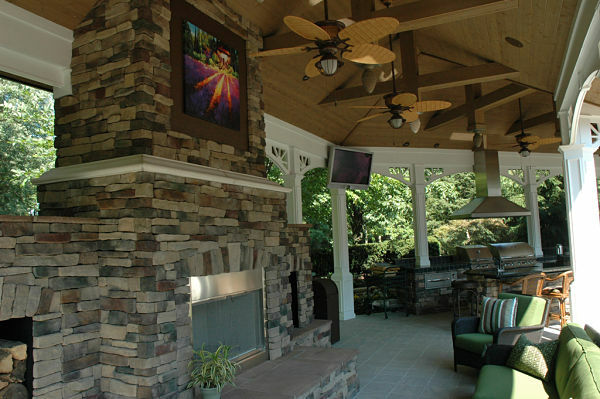 A 20-foot cultured stone gas-burning fireplace was designed to warm the addition on cool nights. The deep hearth allows for extra seating in the sitting area of the veranda. The fireplace insert is from Heat-n-Glo. The façade is dry stack cultured stone. 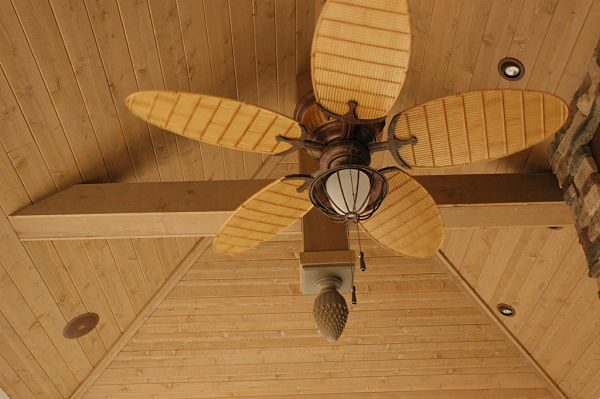 Interior design details include a southern style ceiling with v-grooving, decorative trusses and large tropical paddle fans. Pineapple motif finials were placed on the ceiling. Detailed columns with arches and starburst-motif corner trims were selected to provide architectural interest. The finials and millwork are from Fypon. Cultured stone was used on the bar, fireplace and perimeter walls. 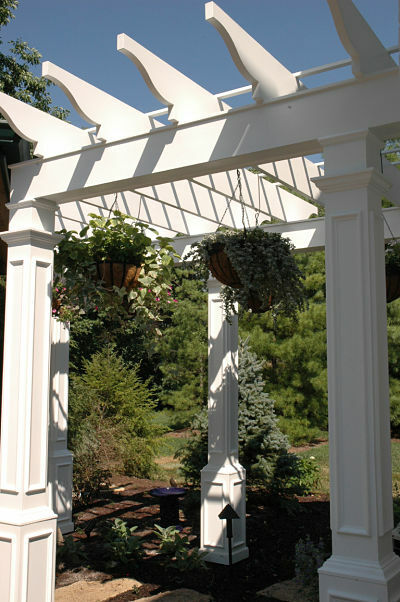 Homeowners association covenant requirements were met by adjoining the veranda to the home with an arbor supported by columns that matched those used within the veranda. Stainless steel appliances were used in the galley style kitchen. 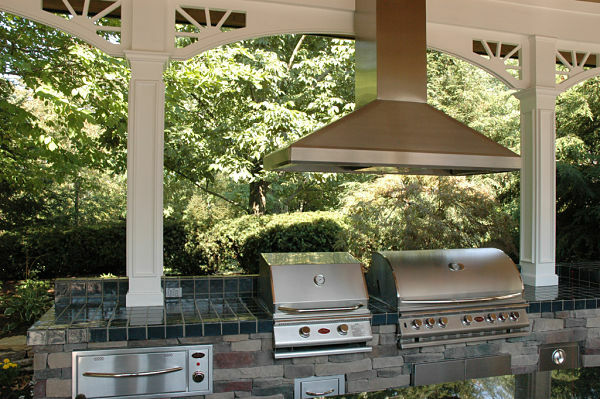 The grills and refrigerator are from Cal Spas and the exhaust hood is from Vent-a-Hood. A flat screen plasma television designed for outdoor use was added and positioned to be viewed from both the bar and seating areas. The ceramic tile flooring matches the cultured stone. The flooring will endure the outdoor climate. A new footpath leading to the gardens was added.